Prince Charles’ Ladybird book is now officially released. I suggest we might want to leave a few comments! Since Prince Charles is a self confessed expert on everything including architecture, agriculture and now,climate fluctuations [well, all sorts of people are experts on that!] I suppose we must all accept his gracious intervention and thank the Almighty for His Royal pontifications. I pre-ordered a copy on amazon but after 2 days from the release date it hadn’t been posted, so I cancelled and ordered another copy from someone on ebay. That copy has been sent but I haven’t received it yet. Phillip? Your kidding? Maybe Trump doesn’t realize that the global temperature has risen almost one degree C and sea level is not yet a foot.. half-a-meter after two hundred years and 120 ppm of our added CO2? His Royal Highness refers to the person, not his intelligence. To be fair, Alec, the Windsors have never claimed to be the sharpest knives in the box. We could probably do with a few more people with HMQ’s sense of duty though. Agreed. A very long life spent keeping the promise she made. I always like the Sandhurst motto: ‘Serve to Lead’. A gentleman but sadly very gullible on climate change. And with strange ideas about architecture. I hope this modest attempt to alert a global public to the “wolf at the door” will make some small contribution towards requisite action; action that must be urgently scaled up, and scaled up now. 2. There is no real evidence of an emerging problem with climate, just recent examples. 3. A shortage of figures. e.g. Sea level rise is mentioned, but not by how much, and whether it is accelerating. The polar bear has come to symbolize the threats posed to wildlife by climate change…. 5. Goes into the benefits of constraining warming to 1.5C through mitigation and the dangers of letting the rise go beyond 2C of warming. They forget to mention that if a doubling of CO2 levels leads to 3C of warming, then the rise from 280ppm to 400ppm would give 1.544C of warming. With other GHG gases that should be 2C already in the pipeline. So the picture of three young people holding a banner with 1.5 to stay alive is of the doomed who we can do nothing about, or false alarmism. 6. Page 36 has an egg-timer graphic adopted from the IPCC Synthesis Report of 2014. It shows that the world has emitted 2000 billion tonnes of CO2 so far; can emit 1000 billion tonnes of CO2 before the 2C barrier is breached; and is emitting 40 billion tonnes of CO2 a year. Only the IPCC has data up to 2011, is for greenhouse gases in tonnes of CO2 equivalent, and the figure is currently nearer 55 GTCO2e not 40. 7. The policy-proposals are centered around what individuals in the UK can do. That is recycle more, eat less red meat and turn the heat down. There is no recognition that the it is global GHG emissions that cause atmospheric GHG levels to rise. If the theory is correct, constraint of global warming mean global emissions reductions. That includes the 80%+ of the global population who live in countries exempt from any obligation to constrain emissions. In other words, a nice brief summary of the woeful state of climate alarmism. Agreed: any professional can with time prove that IPCC pseudoscience is based on science fraud. However, it’s a subtle point in that the assumption that Planck’s and Bose/Einstein’s radiant theory for a vacuum applies to a planet’s surface and its GHG atmosphere is deeply engrained. It implies 40% more energy than reality. So, the climate establishment had to devise firstly a ‘negative convection’ claim, admitted in 2000 by Hansen to an AIP interviewer to be ‘a fudge’, then replace it with a Kirchhoff’s Law of Radiation approach (UKMO), in turn based on incorrect cloud aerosol optical physics. The incorrect optical physics comes from Sagan and Pollack (1967) and Hansen (1969). It is sensible to treat this as a mistake, but it reverses the sign of the real 2nd AIE, the real AGW and responsible for the amplification of Milankovitch insolation change at the end of ice ages. Poor HRH and most atmospheric scientists taught that Planck was right and there is imaginary ‘bidirectional photon diffusion’ are woefully under-prepared to understand such a perversion of basic physics – very subtle. Planck and Bose/Einstein were correct, but not for a GHG-containing atmosphere. B-E statistics still applies though, but not at the surface for GHG IR wavelengths. Arguing about the physics ends up in arguments unintelligible to those without a degree in physics and well-read in the particular area. There is a well-known troll (also a Professor of Astrophysics) who would produce a wordy argument and run-off a few equations. But these arguments are meaningless sophistry to real science. That means testing the theory against the real world. This is especially true in extremely complex systems such as climate (or economics which I studied) where we will never know all the variables or the magnitude of the inter-relationships. There must be some empirical test that would at least show whether the theory is wide of the mark. That I believe can be done with the CO2 data and the HADCRUT4 data. The rate of rise in CO2 levels accelerated around the turn of the century. The rate of warming should have increased. It is only by a lot of arm-waving and a series of ex-post hypotheses that you can account for 10-15 years of anomaly. I go through the numbers here. Sorry if what I wrote is a bit too physical, manicbeancounter. However, the details are quite clear once one applies B-E statistics to GHGs in contact with condensed matter. To repeat: the problem is that the pseudoscientists have had to choose between following Goody and Yung, who pushed the bidirectional photon transfer argument, which is only correct for a vacuum, and reality, which is that GHGs are virtual emitters, creating a flat emitter in contact with the surface. Maxwell’s Equations do the rest with the opposite sign wave functions cancelling each other out to the level of the lesser amplitude wave. On point 6, I mistakenly said that the Ladybird Book had incorrectly interpreted the IPCC Synthesis Report in its egg-timer. It is the IPCC that is at fault. 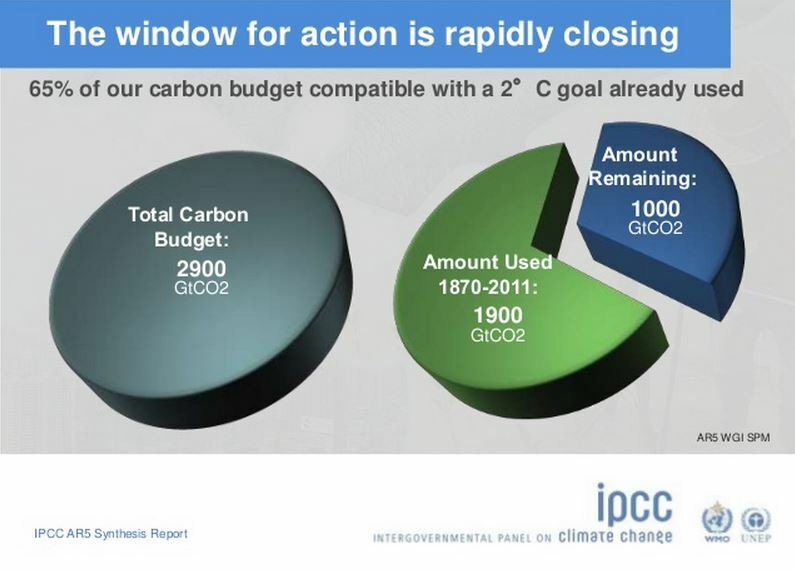 In 2014 the IPCC did a simplified presentation of 35 slides to summarize the Synthesis Report Summary for policy makers. The Ladybird egg-timer is lifted from slide 33 of 35. As a (slightly manic) beancounter I like to reconcile the figures. How are the 1900 GtCO2 and the 1000 GtCO2 arrived at? 1. A doubling of CO2 will lead to a warming of 3C. 2. If the pre-industrial level of CO2 was 280ppm, the dangerous CO2 level will be reached at 445ppm. Rounded this is 450ppm. 3. In 2011 the Mauna Loa CO2 level was 391.63 ppm. 4. 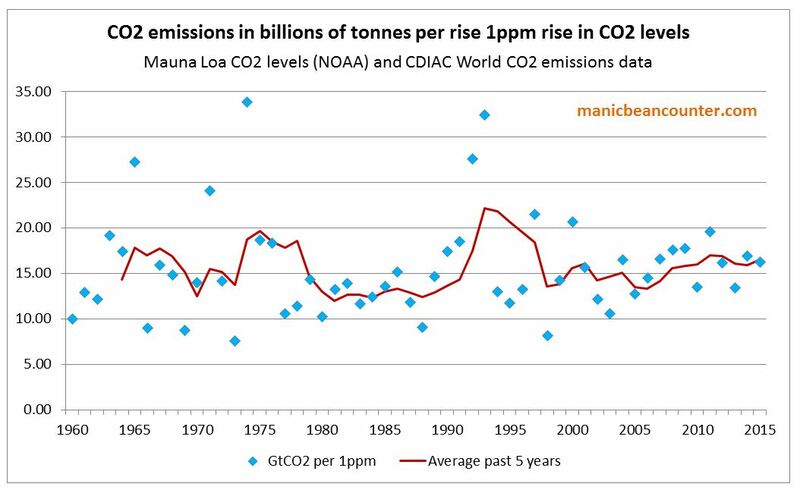 Using the CDIAC World CO2 emission figures, gives the following figures for billions of tonnes of CO2 to achieve a 1ppm rise in CO2 levelsin the graph below. In the five years to 2011 on average it took 17.01 billion tonnes of CO2 to raise CO2 levels by 1 ppm. Lets round it to 17. Add 58.82 (=1000/17) gives 450.58. Given rounding, this pretty close to 450ppm. Of course, the Ladybird Book should have added in another 4 or 5 years of emissions (or stated the baseline year). But for the IPCC to base their calculations on CO2 alone, when earlier charts include total greenhouse emissions is totally out of order. On CO2 if CS=3, the 1.5C barrier from CO2 alone was reached by the time of COP21 Paris. Add in other greenhouse gases and 2C of warming should have been in the pipeline. Great points, and fascinating that 17 b tonnes CO2 emissions correlates with a level increase of 1 ppm. It is also possible that the increase is a Henry’s Law effect, as the climate warms naturally from the ice-age carbon dioxide is driven from the seas: thus the correlation may be unrelated to causation. That would really upset the fanatics who are determined to believe that it is all our fault. The theory on The Greenhouse Gas effect has yet to be proven one way or the other. How many nuclear reactors could we have built and have running if we hadn’t been misled by all this hypothetical rubbish any way? ‘Expert book’? Shome mishtake shurely – as the saying goes. Royal inbreeding is a sad and dangerous thing…..
Perhaps not,the late Queen Mother was not royal. She married a Royal Duke and became Queen because of the abdication of her brother in law..not what was expected by anyone. So no inbreeding there. HR H is patron of several organisations by default.. He is expected to uphold their tenets. As a republican, it is easy for me to attack the royals and agree with Bitter&twisted. However, a much more serious point is that the clown prince wants to dictate policy to the Proles and their government: this is totally incompatible with their supposed keeping their noses out, even though they own the trough. The book is referred to as part of the “science” group of books, fair enough for the one on quantum mechanics, by a proper physicist, and the one on evolution, by our old friend the BBC snail expert, for once demonstrating some integrity by sticking to his field. Environmentalism and conservation are not sciences, they are political ideologies, shame on the Roy Met Soc for anointing the book as science, giving it the prized “peer-reviewed” status, clearly designed to shut everyone else out of the debate. Nothing seems to have changed as a result of ClimateGate and the inside stories coming out of the IPCC and the Hockey Stick fiasco. Well, once there was a story called “Charlie and the Wolf”. After a few short moments of concentration, folks simply relaxed, and took no more notice of the AGW doom and gloom. They got on with their lives, leaving Charlie to tend the garden, as he always had. Used ones already available at 3 quid and new ones from only £2.36 as opposed to Amazon’s £7.99. I am not sure it is even worth that to be able to comment since I don’t think we should follow the warmist route of making comments having not read the book. The are being sold on ebay for as much as £12.99 but that includes “free” postage. £7.99 is the rrp, but the lowest I can find is £6.44 including postage.